Raúl Castro coming to United States: U.N. speech reason for first visit as Cuban head of state. 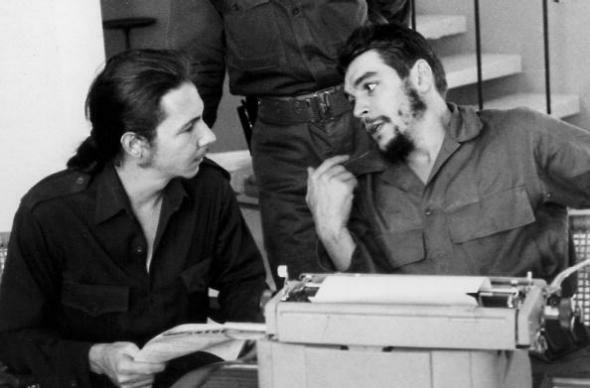 Raú Castro, left, and Che Guevara in Havana in 1960. The latest public schedule for the General Assembly’s annual gathering of world leaders - the so-called General Debate - lists Castro as speaking on the afternoon of Sept. 28. U.S. President Barack Obama and the leaders of Russia and China and Iran’s president are also due to speak on the same day. Castro assumed power in Cuba from Fidel, his older brother by 5 years, in 2008. Fidel Castro spoke to the United Nations in 1960, 1979, 1995, and 2000; in 1960, Fidel gave the longest speech in U.N. history (4 hours and 29 minutes). In 1995 and 2000, he also also spoke at churches in Harlem. The brothers reportedly yelled profanities at each other for hours while staying at Houston’s posh Shamrock Hotel. “It was a screaming match,” said Brian Latell, a former CIA analyst and author of the 2006 book, After Fidel: The Inside Story of Castro’s Regime and Cuba’s Next Leader. Witnesses eavesdropping outside the Castro brothers’$2 18th floor suite couldn’t make out exactly what they were saying but think they were fighting about how the revolution ought to proceed, Latell said.